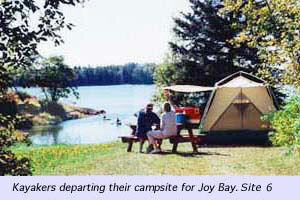 Mainayr Campground is a small, rustic campground with 35 sites on tidal Joy Cove. Many sites feature a water view, some have more trees, and some are more open meadow. Most sites are shaded and grassy, with screened areas. Sites with hook-ups are also available, and we have a dumping station for RVs. Every site has a fireplace and picnic table. We provide showers and flush toilets. We welcome all pets. Please remember to clean up after pet and dogs need to be on leashes. Thank You. Joy Cove empties into Joy Bay, then Gouldsboro Bay, then finally the Gulf of Maine. Our beach and point areas are great spots to set in a kayak or canoe, and many campers use Mainayr as their starting point for multiple-day kayak trips up the eastern coast, returning after several days of ocean travel. Mainayr is also on the Maine Sea Kayak Trail route. Please see our campground site views slideshow on our Map of Sites & Rates page. 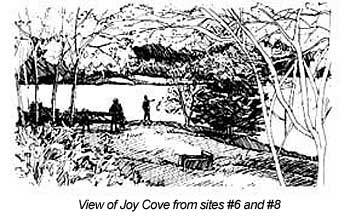 "Mainayr, a small, pleasant campground, offers quiet tidal estuary boating on Joy Cove. South of Joy Cove are the more open waters of Gouldsboro Bay. Campsites are mostly wooded and private." - Lee Bumstead, author of "Hot Showers: Maine Coast Lodging for Kayakers and Sailors"